NISA's Tips & Tricks: Touhou Genso Rondo Bullet Ballet | NIS America, Inc. This Week - Yukari and Flandre! We’re here with an awesome edition of NISA’s Tips & Tricks where we provide you doods with…tips and tricks on how to defeat your opponents! 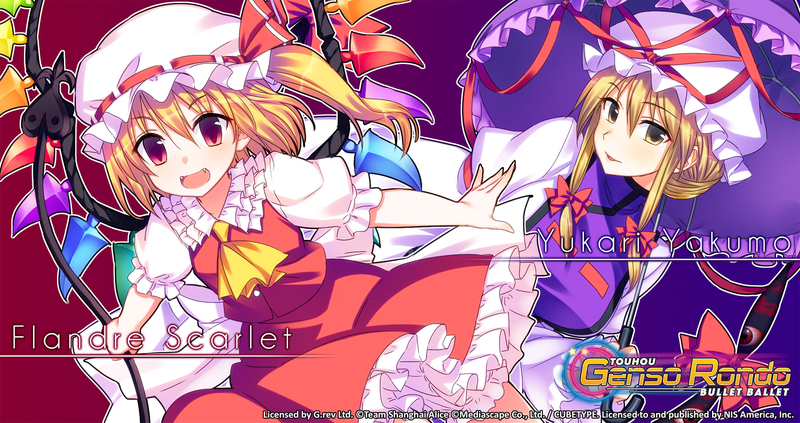 With our upcoming release of Touhou Genso Rondo: Bullet Ballet, we are excited to announce that Flandre Scarlet and… *drumroll* Yukari Yakumo are going to be added as DLC for the PlayStation®4 release! Make sure you preorder today at our NISA Online Store, Amazon and Gamestop! Before we get into the finer details on how to utilize Yukari and Flandre in-game, check out the bios of both characters, and make sure to get to know ‘em well! Bio: An elusive yokai who suddenly appears out of nowhere. She is nocturnal, and hibernates through the winter and awakens in spring. As one of the oldest living yokais in Gensokyo, she is very powerful. She is very knowledgeable about the land of Gensokyo, which is rare even among the yokais. She is one of the few people who can pass through the boundary to the outside world. She has the ability to manipulate any kind of boundary. The phenomenon that humans refer to as being "spirited away" is caused when Yukari causes the boundaries to fluctuate. She has been good friends with Yuyuko for a long time. Bio: She is Remilia's little sister, and is very attached to her big sis. She is a vampire and a magical girl. For 495 years, she has been imprisoned in the basement of the Scarlet Devil Mansion, and has never once gone outside. However, she doesn't even try to leave. Thanks to Reimu and Marisa, she has become interested in things beyond the mansion, excluding humans. Recently, she has had more interaction with others, and was even interviewed for Aya Shameimaru's newspaper. So now that you got some sweet bios, here’s how to beat your enemies *ahem* I mean, friends in Touhou Genso Rondo: Bullet Ballet! Starting off with… Yukari Yakumo! How To Use Yukari Yakumo & Win! While this particular move can be used for any character in Touhou Genso Rondo, it is a move that is highly important for Yukari to increase her regular attack. Let’s say you fight against Remilia Scarlet, who is known for her forcefield bullets that eventually scatter throughout the map. If you time it correctly, you can hit circle and turn Remilia’s bullets into precious P items that will make your attacks stronger! Whenever you face an opponent, make sure to be aware of all of the bars on the screen, especially your charge bar. To increase your charge bar, simply dodge bullets coming at you. Well, maybe “simply” isn’t the correct term because certain characters’ danmaku can be quite overwhelming and almost impossible to dodge, but it is definitely possible. When Yukari uses her R1 + △ attack, it takes about half of a green bar with good reason. It enables her to teleport as well as expel a 6 way attack AND an array of bullets. That way, you can escape with caution, but still have a chance to attack your enemy. Yukari’s main attack may be fast, but the spread of her attack is quite small. While she can be quite agile with her teleport attack, her movement speed is overall slower than other characters, so when teleporting, make sure to plan ahead and attack when you have a better opening. Yukari’s widespread attacks are incredibly important to utilize because she can hit opponents from various angles. On that note, her widespread attacks can also be a weakness if her opponents are able to dodge her danmaku. Unfortunately, she does not have any homing attacks, so plan ahead when using her attacks. If you’re not constantly moving with her and teleporting from area to area, you’re going to struggle. She is a character that experienced players should try out. How to Win with Flandre Scarlet! Her Slow + Main attack makes a cuuuuuuuuuute heart shape, but don’t let the cuteness fool you! When activated these bullets head straight toward your opponent, so if your opponent isn’t paying attention and is staying completely still, they might face the wrath of Flandre’s homing attack. . Her L1 + △ attack is a similar minus the homing bullets. However, there are more bullets that shoot out! But remember, you won’t be able to use this attack if you have nothing in your charge bar, so use it sparingly. She has high overall attack power, especially when fighting at medium range. There are two attacks that you should take advantage of. Her L1 + X attack brings up two blue crosses that travel in opposite directions of each other to hit any opponent in the mid range. There is also her regular Sub Attack by pressing X where a red laser is activated as she spins, creating a good defense for opponents in the mid range. Accuracy of shots is much higher at a medium range and taking advantage of her high attack power will help you win against your opponent. Flandre Scarlet is one of the cutest characters in Touhou Genso Rondo, which definitely isn’t a disadvantage, but man, she is surprisingly slow for a vampire. Don’t vampires have superhuman speed? ¯\_(ツ)_/¯ I digress. If you are fighting against faster opponents like Sakuya and Aya, you might have some trouble keeping up. Plus, her defense is slightly lower than others, so make sure to use her strengths/mid-range well. Touhou Genso Rondo: Bullet Ballet comes out in North America and Europe in September 6 and September 9, respectively. Stay tuned for our upcoming Touhou Genso Rondo blogs to learn more about the playable characters and how to be the ultimate danmaku master!